Rapid Sand Filtration | SSWM - Find tools for sustainable sanitation and water management! Rapid sand filtration is a purely physical drinking water purification method. Rapid sand filters (RSF) provide rapid and efficient removal of relatively large suspended particles. Two types of RSF are typically used: rapid gravity and rapid pressure sand filters. For the provision of safe drinking water, RSFs require adequate pre-treatment (usually coagulation-flocculation) and post-treatment (usually disinfection with chlorine). Both construction and operation is cost-intensive. It is a relatively sophisticated process usually requiring power-operated pumps, regular backwashing or cleaning, and flow control of the filter outlet. Rapid sand filtration is common in developed countries for the treatment of large quantities of water where land is a strongly limiting factor, and where material, skilled labour, and continuous energy supply are available. Rapid sand filters evolved at the end of the 19th century in the United States and quickly gained popularity. By the 1920s, they were widely used as a major water purification method, since necessary facilities required less land area compared to slow sand filters. Today, a combination of flocculation and coagulation, sedimentation, filtration and disinfection (e.g. chlorination, ozonation) is the most widely applied water treatment technology for treating large quantities of drinking water in industrialised countries (SDWF n.y.) (see also treatment plant set-ups). Rapid sand filtration, in contrast to slow sand filtration, is a purely physical treatment process. As the water flows through several layers of coarse-grained sand and gravel, relatively large particles are held back safely (DIJK & OOMEN 1978). However, RSFs never provide safe drinking water without adequate pre-treatment and final disinfection. Usually, coagulation and flocculation and chlorination are applied for that purpose. The filter chamber is usually made out of reinforced concrete, filled with sand and gravel to the height of 1.5-2 metres. The water is supplied to the top of the sand-bed and filtered as it flows through the layers of graded sand and gravel. A system of perforated pipes on the bottom drains the chamber (WHO 1996). The filter chamber can be constructed as open tanks (rapid gravity filters) or closed tanks (pressure filters). This filtering process is determined by two basic physical principles. First, relatively large suspended particles get stuck between the sand grains as they pass the filter medium (mechanical straining). Second, smaller particles adhere to the surface of the sand grains caused by the effect of the van der Waals forces (physical adsorption). A chemical filter-aid (i.e. coagulant or flocculant) might be added to promote additional adhesion (SCHMITT & SHINAULT 1996). In the course of these processes, more and more particles accumulate in the filter medium, increasingly causing clogged filters and decreased performance. Initial filtering performance can be re-achieved through a cleaning of the filter bed. This is usually conducted through backwashing: the flow of water is reversed, so that treated water flows backwards through the filter. The sand is re-suspended and the solid matter is separated in the surface water. Often, air is injected additionally to support the cleaning process (WHO 1996). As soon as most particles are washed out and the backward flowing water is clear, the filter is put back to operation. Clearly, relatively large quantities of sludge are generated through backwashing and require some form of treatment before discharge into the environment (UNEP 1998). Rapid sand filtration is a highly effective method to remove turbidity if it is correctly applied (BRIKKE & BREDERO 2003). Equally, solids formed during pre-treatment, i.e. coagulation-flocculation, are filtered. A well-operated RSF reduces turbidity to less than 1 NTN and often less than 0.1 NTU (WHO 1996). Regarding the removal of most other contaminants, the RSFs are ineffective. If combined with adequate pre-treatment measures and final disinfection, rapid sand filtration usually produces safe drinking water. The construction of a RSF requires the supervision of a competent engineer and highly skilled workers. It involves the construction of reinforced concrete fundaments and walls and many technical installations. Only a very precise realisation guarantees a functioning water treatment. Operation of a rapid sand filter consists of flow control, regular backwashing and cleaning. The period between backwashes depends on the quality of the influent water and normally lies between 24 – 72 hours (UNEP 1998).The cleaning process requires an interruption of the purification process of 5 - 10 minutes per filter bed. Several parallel filter units are required to guarantee constant water supply. The backwash process must be observed carefully; in particular the rate of flow must be controlled to avoid erosion of the filter medium. Periodic repacking of the filter bed may be required at infrequent intervals to ensure efficient operation (UNEP 1998). Operation and maintenance thus requires skilled and highly reliable workers. The construction cost of rapid sand filters is determined primarily by the cost of materials such as cement, building sand, gravel, reinforcing steel, filter media, pipes, and valves. However, the cost of land and transport of materials could add substantially to the total cost (UNEP 1998). The cost of energy required to operate a rapid sand filter and the costs for treatment of generated sludge during backwashing may add significant costs (UNEP 1998). Although operation is usually conducted automatically, frequent inspection by a well-educated worker is necessary to ensure proper treatment. Maintenance costs will include repairs of the filters and replacement of equipment. In general, construction, operation and maintenance costs for rapid sand filters are significantly higher than costs for slow sand filters (UNEP 1998). Rapid sand filtration requires very complex technical installations, highly skilled workers for construction and operation as well as large energy inputs. Unless pre-treatment and disinfection is applied, the filtered water is not safe for drinking. Its application is hence reserved for industrialised countries or urban areas where land is a limiting factor. RSF can provide a very efficient method in larger urban water supply systems if preconditions are met. For any other areas, RSFs are usually economically unreasonable. This very comprehensive technical paper includes important background information, a detailed description of the principle of slow sand filtration and much information on the construction, design and implementation of slow sand filtration plants. The object of this volume is to discuss the various aspects of one particular form of water treatment - the "biological filtration" or "slow sand filtration" process. This system of water purification has been in continuous use since the beginning of the nineteenth century, and has proved effective under widely differing circumstances. This document briefly introduces the typical drinking water treatment process in many developed countries including coagulation, sedimentation, filtration, disinfection and storage. This document provides an easy to read and yet comprehensive introduction to the water treatment process with slow and rapid sand filters while particularly addressing the multi-barrier principle. 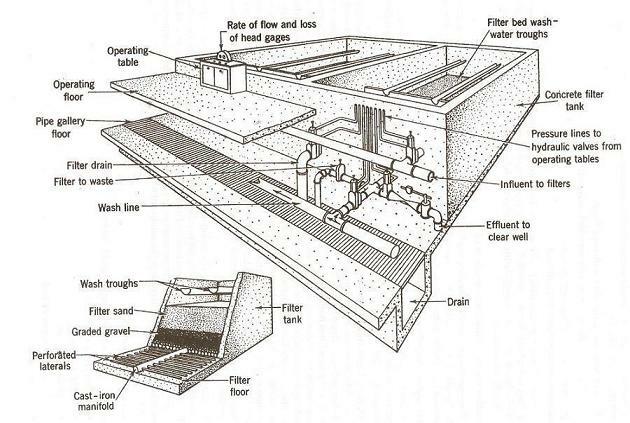 A factsheet on slow sand filters work compiled by the WHO. It includes a paragraph on how sanitary inspections of rapid sand filters should be conducted. This websites elaborates on the structure of a rapid sand filter. Varied information on technical issues is presented in detail.